This is a very calming and satisfying soup preparation which does not involve many skills to prepare! Each spoonful of this delicious soup will calm your senses and the subtle aroma of fine herbs will delight your taste buds. 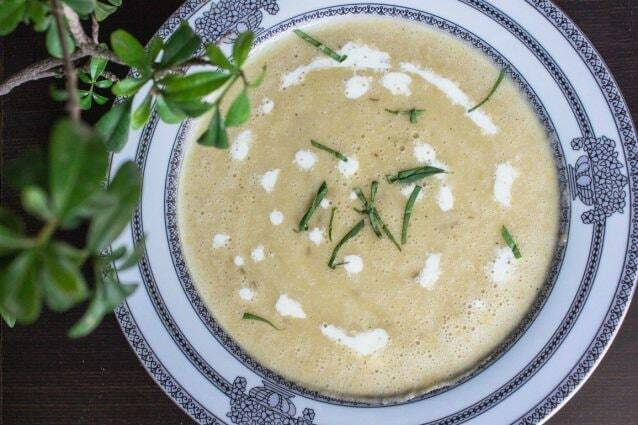 Potato leek soup is best enjoyed on a cold wintery day either for lunch or dinner. 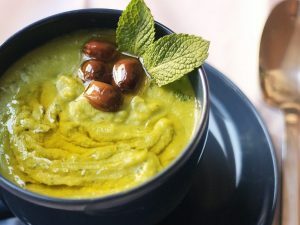 If you plan to serve this hearty soup to your guests, you may prepare the soup until step 9 even a day in advance and then resume from step 10 minutes before you plan to serve the soup to your guests! Heat butter and olive oil together in a large pot until the butter melts. Add the leek slices and garlic to the melted fat and sauté it all for 2 to 3 minutes. Stir in potato cubes and bay leaf to the pot and let it cook for another 5 minutes. Sprinkle the dried herbs and spices in to the pot, that is, dried rosemary, dried basil, salt, and black pepper powder. Stir the spices well with the vegetables for about 30 seconds. Pour the vegetable stock in to the pot and stir contents of the pot really well. Cover and simmer the soup for about 10 to 12 minutes, or until the potatoes cook. Now, cool down the soup to almost room temperature. Remove bay leaf from the soup pot and transfer the soup to a blender jar. Blend the soup nicely until it is well blended and no potato lumps are present. Transfer the blended soup to another pot and bring the soup to a boil. Adjust the seasonings, if required. Now transfer the soup to the serving bowl and garnish the soup with a drizzle of fresh cream, shreds of basil, and enjoy! Do not add the hard leafy part of the leeks and rather just add the softer leafy part to the recipe. Make sure you blend the soup really well and have no potato bits and pieces floating around. You may also add about half a cup of fresh cream to the blended soup while giving the soup a final boil. Do not forget to remove the bay leaf from the soup pot before you blend the soup. 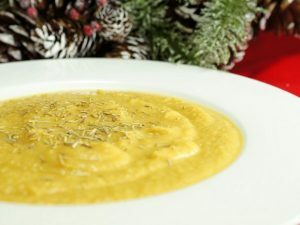 You may also use a hand blender to blend the soup in the pot itself instead of transferring the soup to a blender. In either case, just make sure the soup is smooth in consistency.